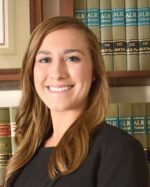 Kara G. Bidstrup - Glassman, Wyatt, Tuttle, and Cox, P. C.
Kara Bidstrup joined Glassman, Wyatt, Tuttle & Cox as an Associate in November of 2018 after graduating from the University of Memphis Cecil C. Humphreys School of Law and successfully passing the Tennessee Bar Exam. Throughout her law school career, Kara served as Judicial Law Clerk for the Honorable Rhynette Northcross Hurd of Shelby County Circuit Court and as a Judicial Intern for the Honorable Bernice Bouie Donald of the U.S. Court of Appeals for the Sixth Circuit. She was an Articles Editor of the University of Memphis Law Review Vol. 48 and a Student Ambassador of the University. Additionally, Kara served as a Student Justice on the University of Memphis Honor Council, held leadership positions in the Association of Women Attorneys and the Public Action Law Society, and volunteered as an Assistant Prosecutor for the City of Germantown. Bernice B. Donald and Erica Bakies, A Glimpse Inside the Brain’s Black Box: Understanding the Role of Neuroscience in Criminal Sentencing, 85 Fordham L. Rev. 481 (2016).